Kenya have denied they will retaliate against Nigeria for the alleged mistreatment of the Harambee Stars by the Nigeria Football Federation when they visited the country for their first leg 2014 World Cup qualifier. The Super Eagles, who are tied on five points with Malawi in Group F of the World Cup qualifiers, have a make-or-break second leg clash against the Harambee Stars in Nairobi on June 5. Football Kenya Federation had alleged that the Harambee Stars and their officials were accommodated in a substandard hotel in Lagos after missing their flight to Calabar, where they held the Super Eagles to a surprise 1-1 draw on March 23. The Kenyans also claimed that they were not given any security while in Lagos and had to find a football field to train. They ended up at the Ajao Estate Primary School in Oshodi. But the NFF dismissed the allegations, insisting that the football house gave the Kenyans a royal welcome. Nairobi-based Daily Nation reported during the week that Nigerian football authorities were worried about “a possible retaliation for the poor treatment they accorded the Kenyan team in March at Calabar when they play Harambee Stars in June”. 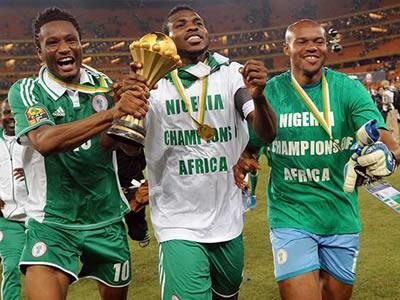 They claimed that the NFF had yet to inform the Football Kenya Federation of their arrival date. However, the FKF Chief Executive Officer Micheal Esakwa said everything needed by the Nigerians would be provided by the country. Kenya, who are rooted to the bottom of the group with two points, need victory in the match to reignite their hopes of reaching the last round of Brazil 2014 qualifiers. However, the NFF Secretary-General Musa Amadu told Lagos-based Brila FM on Wednesday that the Eagles would arrive in Nairobi from Europe on June 4 ahead of the encounter.